Bakers Shoes, bakersshoes.com, is the go to shop for fashion shoes for women. Bakers Shoes offers great deals on boots, flats, sandals, dress shoes, wedges, and more. Before shopping at Bakers Shoes, be sure to stop by RetailSteal for the latest Bakers Shoes coupon codes and discount codes. Bakers Shoes also offers shipping promos that change often. Visit RetailSteal for the latest Bakers Shoes shipping specials. Save up to 75% on dress boots at Bakers Shoes. Enjoy over 50% savings on clearance at Bakers Shoes. 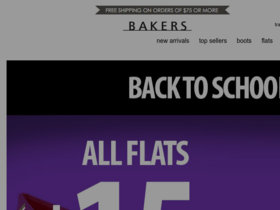 Enjoy free shipping on orders $75+ at Bakers Shoes. Enjoy exclusive promos with email sign up at Bakers Shoes. Enjoy 3 pairs of shoes for $99 at Bakers Shoes.